Prosecutors in Bulgaria have brought terrorism charges against two men for the bombing at Burgas airport, which happened exactly four years ago, to the day. Hassan El Hajj Hassan and Meliad Farah were accused of detonating a bomb carried by suicide bomber Mohamas Hassan El Husseini. 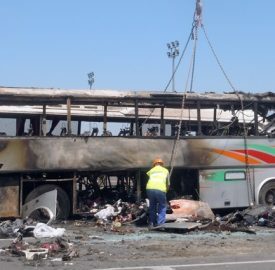 The explosion in Burgas killed five Israeli tourists and one Bulgarian bus driver. Many people were injured.